A dual citizenship saga that has gripped Australian politics for almost two months will not be tested in court until October. A preliminary hearing for five of the politicians took place on Thursday. The final outcome could imperil Prime Minister Malcolm Turnbull's slender grip on power. 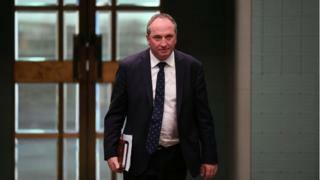 The most high-profile person under scrutiny is Deputy Prime Minister Barnaby Joyce, a New Zealand dual citizen until last week. Mr Joyce sits in the lower House of Representatives, where Mr Turnbull's government has only a one-seat majority. Under Australian law, anyone who holds dual citizenship cannot run for office. If any government MPs in the lower house were to be ruled ineligible, it would trigger a by-election, and Mr Turnbull could face barriers to retaining power. The High Court of Australia said it would conduct the hearings over three days from 10 October, about a month later than the government had hoped. Another Greens co-deputy leader and Canadian dual national, Larissa Waters, who has also resigned. Two UK dual nationals, government Senator Fiona Nash and independent Senator Nick Xenophon, will have their cases referred at a later date. Chief Justice Susan Kiefel acknowledged the issue was unusual and that there was a "high level of urgency" in resolving the debate. However, she rejected a push by Australia's Solicitor-General Stephen Donaghue, QC, to have the cases heard in September, to allow legal teams more time to prepare.